Let’s face the ugly truth. We always knew there were bad apples in the system. We just never knew how bad it really was….until the Philippines Software Industry Association (PSIA) came along and assessed senior level students on their skill sets. The PSIA conducted the landmark assessment of the Entry-level programming skills of students for the period from Oct 2015 to September 2016. 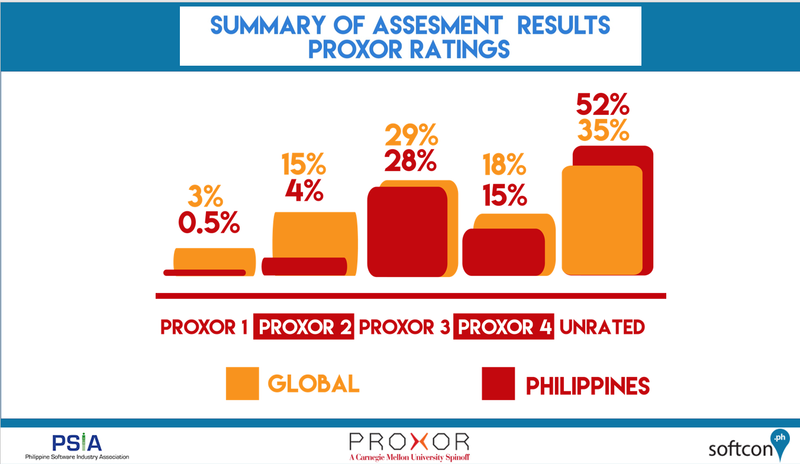 The infographic shown below features the Philippine results in red and global results in orange for comparison and benchmarking. This means that over half (52%) of those tested will not be hired for any coding. Cynics noted that the remaining 43% (Proxor 3 and 4) do not need formal education at all and are better off doing self-study. The dismal results coupled with declining enrollment figures (by as much as 90%) foretell of a hiring crunch in the coming 2 years. The software development industry will face a tough time finding suitable recruits to scale their operations with. Does this spell the doom for the industry? Wait. What is wrong with the system? Lito Averia The problem started a couple of decades ago. There are still schools that teach outdated languages like Pascal. Students are taught the language rather than programming logic which can be applied in any language. Save for colleges and universities that enjoy autonomy from CHED, the curriculum is not constantly updated to keep up with the times. TechVoc schools too produce programmers who are not qualified. TESDA should also look into this. Jerome Auza Maybe the curriculum should be adjusted not to try to make students learn several languages but rather to learn about programming itself which can just be applied on any language. Ray Anthony Uy Pating When your standard curriculum teaches VB6, Turbo C and outdated C++ syntax, and refuses to adopt DevOps and teaching algorithms and not syntax, then yes, this is what you get. Amante Alvaran We may need to reform our curriculum to compete with others, thinking “global approach”. Is it the way schools are run? Calen Legaspi Most schools can’t or won’t invest in hiring qualified teachers. The big schools have to offer 2X industry starting salaries plus scholarships to compete. It’s more because most schools don’t pay profs enough to compete with industry. Dads Cuison Caronongan … please include passion in teaching. Ideally great but in reality, only few teachers fit in to these qualifications/conditions. I have actually raised this same concern – improvement in the quality of programming skills of CS/IT graduates – in one of my privilege meeting with MDICT’s Francis Fernandez and CHED’s Calen Legaspi. And I would say it’s a good start in finding solutions to realize that much needed improvement in our graduates’ programming competency level. Jhonjun Dormitorio suggest using Hackerrank for students/graduates who really have the passion and want to excel in their chosen fields, they can take up the responsibility of training themselves and take one of those exams. Jerome Punzalan What makes this more complicated than in other professions is that, strictly speaking, IT is not just software development. I’d say IT is as broad as Medicine, Nursing and Physical Therapy combined. The BS CS degree is the one where you’d require programming rigor, but how would parents of college students understand the difference between CS and IT? Pepe Cueto …entry-level skill could be irrelevant to some who are quizzed outside their comfort zones. To be more specific, programming can be problem-solving type such as implementing a math model, project-oriented, system-aware which requires core computer system knowledge. A math inclined and trained software programmer who can build a mathematical model to solve a non-trivial problem may not be capable of building a project-oriented software (e.g. GUI frontend) for ordinary consumers because one has to be trained with at least OOP skills. …the bottom-line is that training here usually dictates one’s programming skill, which isn’t described in this survey. Mark Vmann I believe most IT student learn very quickly…they need to learn outside of formal education. Jerome Faustorilla Castaneda My startup 3D Tayo aims to ignite students passion for STEM through Applied Learning Programs. We want to cultivate the maker culture in schools. We hope to inspire everyone, including parents, to become life-long learners. I am very much willing to share my 9 years of OFW experience in Singapore (all 18 yrs) to improve our education system. Sony Valdez If there ever was a call for technical assessment of the curriculum, I would love to help. I have been programming for over 20 years (so I got industry experience), and have a Doctor’s degree in IT (so according to education sector, I am qualified to give opinions and ideas). When I studied for my Doctorate in IT, we have a subject dedicated to getting industry experience (industry immersion) …maybe apply this to Master’s also? Alwin Miester If there are schools/individuals looking for people who could share some insights, practices, usage about some of the trend of today’s technology — PM me. DevopsHQ Community (www.devopshq.org) is dedicated to spread the learning, as much as we could. This landmark study should be a wake-up call for all stakeholders – Government, software industry, Higher educational Institutions and outsourcing developments providers – to stand up and take immediate corrective actions. Finally, my congratulations to the progressiveness of the 28 schools that participated. Their willingness to benchmark themselves is a sign of progress in itself. How many other schools are brave enough to measure themselves as well? My alma mater UP, my daughter’s alma mater Ateneo, and my sons’ alma mater De LaSalle DID NOT participate in the study. These schools and all like them are blissfully unaware of the true state of their system. Is change coming? Let’s wait, pray and find out together. The online team missed the most important infographic. My apologies as well for the markups. Some of the numbering sequence may have been lost when they published the article. Meanwhile, NOI (National Olypiad for Informatics) saw a geometric increase in number of High school participants!! I say remove minor subjects in college, like why am I still studying chemistry when it’s not even related to computers? from my point of view, what i studied 15 years ago is mostly not applicable nowadays.. hello C, Pascal, Foxpro.. with the fast phased development of tech, i think we need students that are really dedicated in the lifelong leaning of this field. don’t accept students just because schools need money. Grasya, thanks for your comment. IT is so fast paced that Schools need to keep investing just to stay updated. This comes at a cost, and so to make it sustainable, they have to accept more students to cover their fees. Accept them, but you don’t HAVE to pass them if they clearly fail. There clearly needs to be a new business model in place. The old existing ones do not work for today’s reality. Maybe as what Thomas Friedman suggest in his book “Thank you for being late”, there is a need for MOOCs to deliver what he calls the “nano” degrees. These are ones that cover a fewer topics (but in depth), and take a shorter time to complete. Having said that, I did notice that not all students are “into” learning/studying. I see some students doing facebook, nodding off to sleep etc, when i deliver presentations on Big Data. So even if you can ‘lead a horse into water” you can’t force them to drink from it. Motivating the students is the first priority, I think.